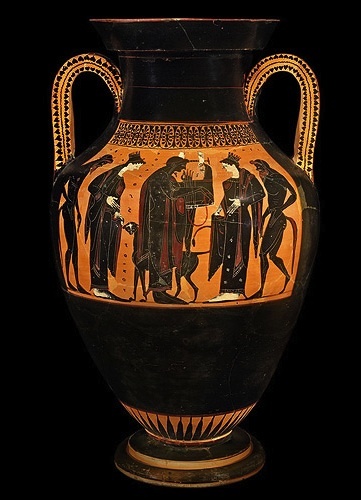 A recent acquisition of the Merrin Gallery, this ancient Greek, black-figured amphora from Athens depicts the apotheosis of Herakles (the Greek name for Hercules). Quite simply a beautiful and very large Attic amphora, dated 520-510 B.C. On the front it is decorated with Athena stepping into her quadriga and holding a spear, Herakles holding a club and bow, Dionysos holding vine branches, and Hermes leading the team. On the back it depicts Apollo Kitharoidos accompanied by a feline and flanked on either side by a goddess and satyr. For a discussion of these figures, please visit the Merrin Gallery's page on this 2,500 year old Greek amphora. Upon closer observation, there are inscriptions in the field, a palmette-and-lotus chain above each scene, rays above the foot, ivy on the sides of the handles, and the details have been added in red and white by the skillful and renowned Antimenes Painter.